Our goal today was to conquer Lost Mine Trail. 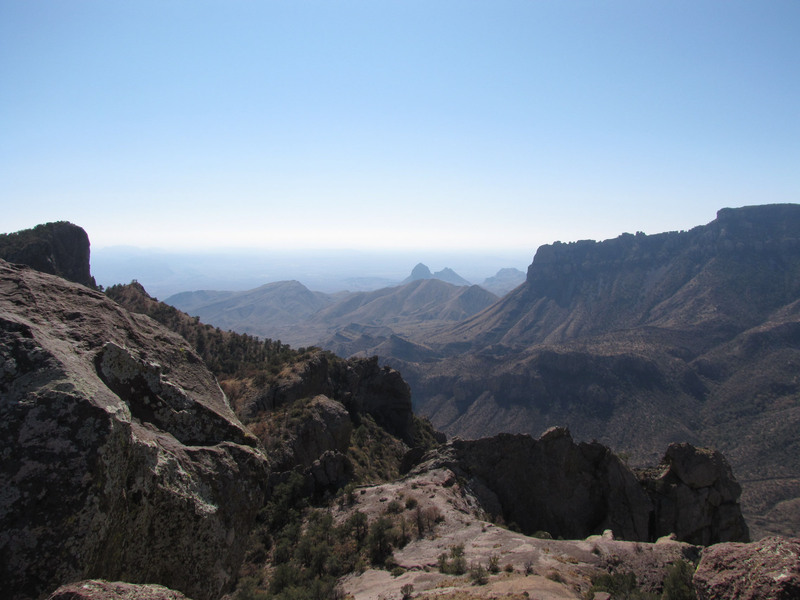 The trail begins about half way up the mountain to Chisos Basin Headquarters. There were only two other vehicles parked there when we began our hike but nearly a full parking lot when we returned. This is panther country and while the bears are sleeping, the panthers roam about hunting for food. Glen helpfully pointed out that all panther attacks were from behind–and so to be safe we should hike up the trail back to back. As neither of us wanted to be the one walking up backwards we decided to take our chances. The trail begins in a deeply wooded area and I was glad for all the extra vests, stocking cap, gloves, and bandanna. I had also swapped out hiking boots for regular sneakers—I definitely need to invest in something better than $15 boots–that are great for motorcycle riding but challenging to spend a week hiking in. A bird at the top hopped around my feet and I poured out a teaspoon of water into one of the depressions–he eagerly drank from it and then hopped away. The way down was not nearly so challenging but I was glad for the jacket. We ate lunch on the bench outside the ranger station at Chisos Basin–and here Glen ‘dropped’ part of his sandwich on his boot–and a Rufus sparrow cautiously approached, grabbed it and flew away quickly with his grand prize. Our last goal of the day was a motorcycle ride for Glen down Paint Gap Road. I stayed at the entrance and investigated the various cacti, small burrows dug under some of them, and then spent some time drawing. Back to the cabin, we spied a covey of quail. Tomorrow we have to pack up to leave this wonderful place–but I’m sure we’ll be back again next year.